5 Reasons To Fill Your Day With Flaxseed! Flaxseeds contain all the makings for an entire plant and are a treasure trove of healthy nutrients. Further proof that Mother Nature is quite the multitasker! 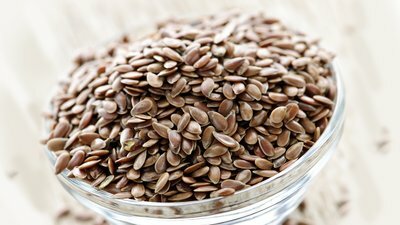 Long before bone broth, green juices, and chia seeds became all the rage, flaxseed had gained a reputation for its health-hiking potential. Today, however, it's been overshadowed by other superfoods crowding the market. That is a shame, considering that the wholesome seeds of the Linum usitatissimum plant are a budget-friendly way to flood your body with the nutrition it needs to look and perform its best. Here are a few research-supported reasons why it's time to once again fall in love with the humble flaxseed. If you would like to support healthy blood pressure already in normal range, flaxseed may be useful. A review published in the Journal of Clinical Nutrition determined that increasing flaxseed consumption, especially for a period of four months or longer, may help support healthy blood pressure. This effect is thought to relate to the seed's synergistic blend of heart-healthy fats, dietary fiber, and lignans—a unique group of phytochemicals present in flax. [2,3] You'll likely experience more health benefits by consuming whole flaxseed instead of flaxseed oil; the former will contain more lignans and fiber. A proper balance of omega-6 and omega-3 fatty acids in your body may help support a healthy exercise-induced inflammation response. The Western diet heavily favors foods rich in omega-6 fatty acids, meaning that omega-3s may need to be increased. Flaxseed boasts a 1-to-4 ratio of omega-6 to omega-3 fatty acids, which can help support recovery. Furthermore, upping the ante of omega-3 fatty acids has been suggested to positively influence body composition when paired with a consistent exercise program. Post-workout flaxseed smoothie, anyone? The average daily fiber intake in America for men and women is 18 and 15 grams, respectively. The recommended intake is 38 grams a day for men and 25 grams for women. Fiber has a significant impact on satiety and supporting blood glucose levels already in healthy range, two variables that are essential to keep body fat at bay. Fortunately, the solution to boosting your daily fiber is simple: Eat more flaxseed! Each tablespoon of ground flaxseed supplies 2 grams of grit. In fact, virtually all of the carbohydrates in the seeds hail from fiber. Up your intake of fiber via flaxseed, and you might have a better chance of winning the battle of the bulge. Our guts are home to a complex community of trillions of microorganisms. This has become the subject of extensive research in recent years as scientists continue to uncover the multifaceted benefits of having a healthy population of critters in your gut. It turns out that making it a habit to eat flaxseed may play a role in supporting your gut microbiome. A study published in the British Journal of Nutrition observed support for good bacteria following six weeks of flaxseed fiber supplementation. It appears that the good bacteria in your digestive tract may munch on this fiber as fuel to increase their numbers. Choosing more nutrient-dense foods and exercising more often is the best way to support a healthy heart. But adding more flaxseed to your day is an easier alternative. Daily consumption of flaxseed has been suggested to help support blood cholesterol levels already in healthy range. As it turns out, the synergistic combination of fiber and lignans found in flaxseed boasts some impressive health-boosting properties. Ursoniu, S., Sahebkar, A., Andrica, F., Serban, C., Banach, M., & Lipid and Blood Pressure Meta-analysis Collaboration. (2016). Effects of flaxseed supplements on blood pressure: A systematic review and meta-analysis of controlled clinical trial. Clinical Nutrition, 35(3), 615-625. Rodriguez-Leyva, D., Weighell, W., Edel, A. L., LaVallee, R., Dibrov, E., Pinneker, R., ... & Pierce, G. N. (2013). Potent antihypertensive action of dietary flaxseed in hypertensive patients. Hypertension, 62(6), 1081-1089. Khalesi, S., Irwin, C., & Schubert, M. (2015). Flaxseed consumption may reduce blood pressure: a systematic review and meta-analysis of controlled trials. The Journal of Nutrition, 145(4), 758-765. Reicks, M., Jonnalagadda, S., Albertson, A. M., & Joshi, N. (2014). Total dietary fiber intakes in the US population are related to whole grain consumption: results from the National Health and Nutrition Examination Survey 2009 to 2010. Nutrition Research, 34(3), 226-234. Brahe, L. K., Le Chatelier, E., Prifti, E., Pons, N., Kennedy, S., Blædel, T., ... & Astrup, A. (2015). Dietary modulation of the gut microbiota–a randomised controlled trial in obese postmenopausal women. British Journal of Nutrition, 114(03), 406-417. Pan, A., Yu, D., Demark-Wahnefried, W., Franco, O. H., & Lin, X. (2009). Meta-analysis of the effects of flaxseed interventions on blood lipids. The American Journal of Clinical Nutrition, 90(2), 288-297.